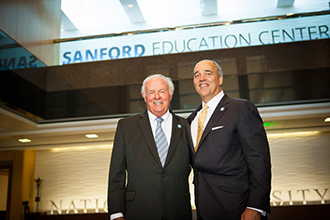 Philanthropist T. Denny Sanford with Dr. Michael R. Cunningham, Chancellor of the National University System, at the 2014 grand opening of the Sanford Education Center. La Jolla, CA – National University, which is among the largest, private nonprofit universities in California, is receiving $2.5 million toward student scholarships that have been designated through the Horatio Alger-Denny Sanford Scholarship Program. The funding is the result of a gift, announced today by the nonprofit Horatio Alger Association of Distinguished Americans, from philanthropist T. Denny Sanford, whose support for education-related causes included last year a $28 million donation to the National University System. The recently-announced national scholarship program in Mr. Sanford’s name totals $30 million and is being distributed through the Horatio Alger Association Endowment to a select group of universities, including National University, the flagship institution of the National University System. The national scholarship, which may go toward supporting 60 scholarships at National University, aims to recognize students who have persevered through adversity and who are dedicated to education and serving their communities. National University, which offers more than 100 programs online and at campuses, has a long history of serving a diverse population of adult and lifelong learners, including a significant military population. Through the recently established Precision Institute at National University, technology-driven and student-centric personalized learning approaches are being explored to offer an even more customized learning experience for all students. National University’s commitment to serving the adult learner population, which accounts for nearly 40 percent of all college students, is affirmed in a report by Washington Monthly, which ranks the University among the Top Twenty colleges and universities in the United States for adult learners and #1 in Southern California. Mr. Sanford’s association with the National University System began five years ago, as he aspired to further his vision for the Sanford Programs, three innovative, research-based initiatives: Sanford Harmony is a PreK-6, social emotional learning program that is now reaching more than 1 million students; Sanford Inspire is an innovative solution developed in conjunction with Teach for America that supports inspiring PreK-12 teaching through teacher education, and is impacting more than 600,000 students; and the founding Sanford Institute of Philanthropy at National University offers educational and training programs to help nonprofits boost their fundraising capabilities. These programs have impacted 38,000 nonprofit fundraisers through a nationwide network of Institutes in collaboration with the founding Institute at National University. The network includes John F. Kennedy University and City University of Seattle, which are both part of National University System. Mr. Sanford is a renowned philanthropist and was named one of “America’s Top Donors” by the Chronicle of Philanthropy and by the Association of Fundraising Professionals, contributing more than a billion dollars to projects aimed at improving our society through children’s causes, education, and health care. In honor of Mr. Sanford’s role in developing and supporting programs that champion inspired teachers, National University renamed its school of education as the Sanford College of Education in 2015. The College is now the 10th largest education school in the country, and it prepares more teachers than any other university in the state of California, based on numbers of credentials recommended. Mr. Sanford also received an honorary doctorate degree from National University. National University’s mission of positively impacting and transforming lifelong learners through world-class education aligns with the Horatio Alger Association of Distinguished Americans, Inc., a nonprofit organization that encouraging youth to pursue their dreams through higher education. The announced endowment to the Horatio Alger Association from Mr. Sanford is the largest single gift in the Horatio Alger Association’s 71-Year History. The Horatio Alger-Denny Sanford Scholarship Program will benefit Horatio Alger Scholars beginning in the 2019-2020 academic year. Founded in 1971, National University is one of the largest private, nonprofit institutions of higher education in California. With more than 150,000 alumni, National University is dedicated to making lifelong learning opportunities accessible, challenging, and relevant to a diverse population of students. Comprised of four schools and two colleges that offer more than 100 degrees, National University recommends more teachers for credentials than any other university in California. National University is the flagship institution of the National University System, a network of accredited nonprofit education institutions serving K-12 students and higher education, which includes City University of Seattle, and John F. Kennedy University. The National University System also includes the Sanford Programs, which serve the PreK-12 education and nonprofit sectors nationally through Sanford Harmony, Sanford Inspire and the Sanford Institute of Philanthropy. National University and the National University System are headquartered in La Jolla, California.